This chapter begins with an analysis of methodological individualism in the sociology of knowledge. There is a current orthodoxy in social sciences that explanations of social phenomena are deficient if they fail to take into account the agent’s own point of view. Such orthodoxy is the reflection of a commitment to MI. According to MI, all social phenomena must be explained wholly and exclusively by individual human actions. In contrast, methodological holism emphasises social determination and materialist macrostructural explanations, which have been largely ignored in the development of contemporary social sciences. Interestingly, a few theoreticians challenged the traditional notion of Marxism as scientific, materialist, holistic, anti-empiricist, antipositivist, dialectical and historical and instead claimed that Marxist philosophy can also be located in the paradigm of individualism. The other social science, which has had immense influence on public health, economics also displays a similar progression towards individualism through the Walrasian, Austrian and finally Chicago schools. The shift away from classical political economics broke the link of economic discourses with holism. The conception that emerged was that of a ‘free’ rational agent facing a set of choices in the open market. 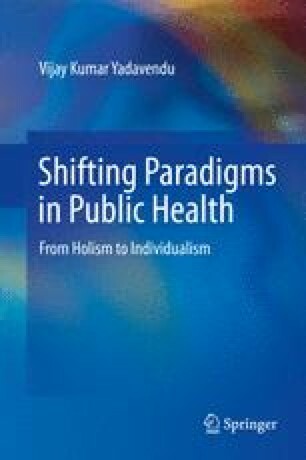 This conception was, by its very nature, ahistorical and ignored the constraints against choosing where market fetishism and behaviourism strengthened the case for biomedical and individual centric approaches in public health. The result was an overemphasis on the determination of specific aetiology, development of curative medicines and preventive vaccines and promotion of the notion of behaviour modification. It also meant that the sphere of the state’s responsibility shrank progressively away from the social sector in general and public health in particular.